My children are 5 months old. One day one or both of them will ask me (most likely when they have their own babies), what was it like? I am writing this post to preserve some of the things that I will otherwise forget. The first few months are already fading into obscurity- the terror, the sense of having our home invaded by two little foreigners with urgent needs who shout at us all day in their own language which we don’t know yet, the horror of four little eyes gleaming in the dark at 3 am, when all you want to do is get drunk and take a Valium and sleep for a month. The feeling of being in extremis, day in and day out, for weeks and months, with no reprieve in sight. The endless experimentation with ways to get them off to sleep: hairdryerdummyrockinginthechairinthearmsearlierlaterherethere intheslinginthepraminourbed. Janek smiled earlier and more willingly, his first unmistakable grin extracted by my father. 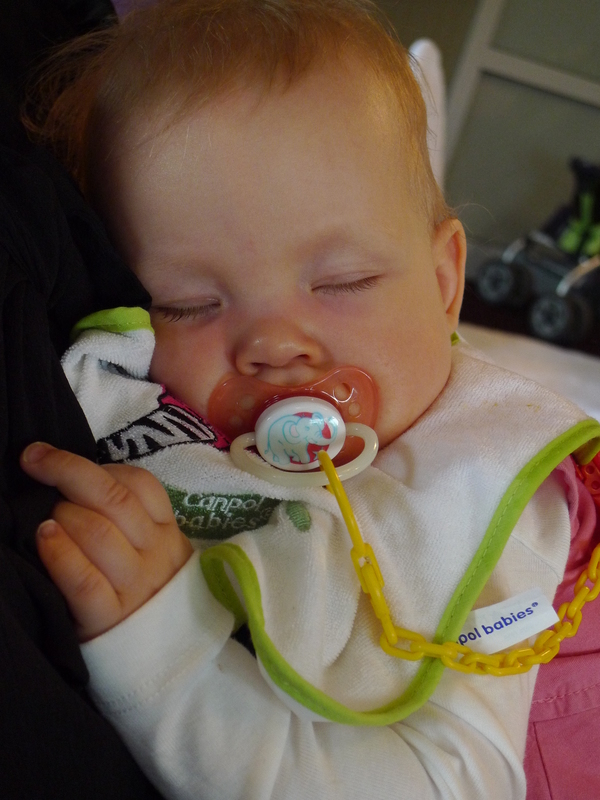 Maja’s gassy grimaces didn’t become unmistakable expressions of pleasure for 10 or 11 weeks. I remember asking myself, why aren’t they more cheerful? They’re getting enough sleep. WHYAREYOUCRYING????!!! !I got angry at them because they wouldn’t do what I wanted or what some 50s style nanny-guru said they should be doing, or because they needed something from me when I felt utterly incapable of providing anything at all. Now I know them better and they are more predictable, but I still adore them most of all when they are both sleeping, wrapped up in their own mystery. Janek’s chin like a downturned comma, his stern little face like some entombed infant pharaoh (Marcin calls him the Chinese Emperor). Maja’s soft fingers, one hand curled, the other extended. (In her waking hours, she likes to poke them in Janek’s mouth, where he clamps down like a crocodile and sets her wailing). I still think a lot about the very early days, and chew them over in my mind the way you do with extreme experiences, trying to make sense of them, trying to understand from my current place of sanity what was happening to me then. Irecall nights in the hospital, during the 10 nightmarish days we spent there after their birth. Marcin would try to leave me at around 9 with 2 sleeping infants, but we were regularly thwarted by weighing time, which fell around bedtime and got us all worked up. They would be fed, changed, drowsy, when we would hear the dreaded rattle of the scale in the hallway. An outrunner nurse would come in and say, “Undress the babies!”, and we would have to take off all their clothes and watch their little limbs start trembling with cold and rage. We would be anxious too, waiting to see if they had gained or lost a few grams since the previous day. One of the nurses (obviously not a fan of the weighing routine) told us that it was a system invented to torment parents. Later on, alone in our quarantine in the dark hours with the pipes groaning and the birthing women wailing, one or another would wake crying. I would feed them, sing “Famous Blue Raincoat”, and whisper my son, my daughter, feeling like an imposter. The words my children still taste strange to me- I have an overwhelming sense that they aren’t really mine. Not that they are changelings, but that they are fiercely and unmistakeably themselves. I didn’t get a good look at either of them until the day after their birth. 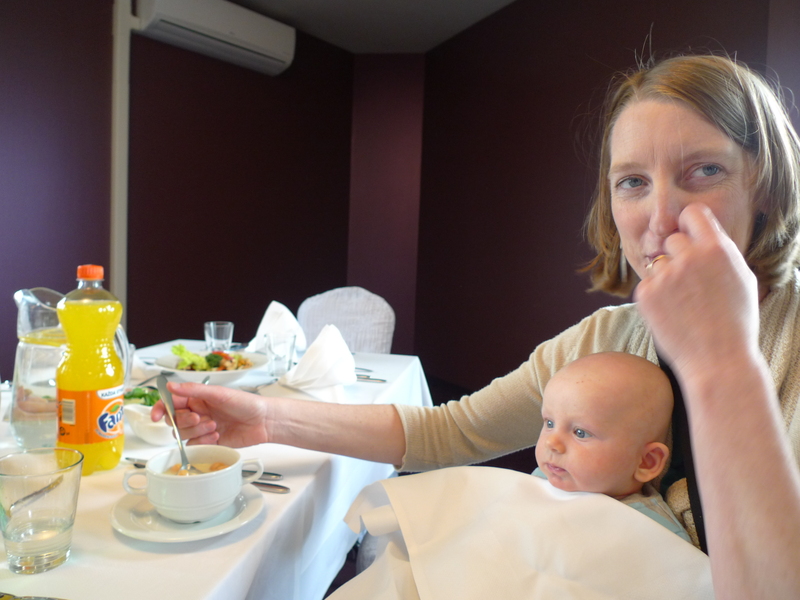 Maja was in intensive care, and as I gaped at Janek in his little wheely bed at 6 in the morning, hoping against hope that he wouldn’t require anything from me until backup arrived, I felt thankful that for the moment I only had one to deal with. It’s unthinkable and shameful to me now that I waited to be called to the newborn intensive care to see her, that I didn’t recognise her and trailed after a man in a shower cap who was pushing a baby wrapped up in an identical swaddle to hers, that I didn’t try to steal her away from under those awful fluorescent lights and the gaze of the hygiene crazed nurses who had shoved her into a corner. At 6 am I would take them for their antibiotics. Outside the window, the snow fell in the yellow light from the streetlamps. I would start to feel a sense of relief that they had survived the night, and that soon one or another of my parents would be there to anchor me in the real world, feed me, and take a part of the burden off my shoulders. Despite functioning on almost no sleep, the days were better- as nightfall approached and Marcin prepared to leave, I would feel a deep sense of dread and as he walked out into the night, I would be full of rage and envy. So when my own children (most likely my daughter will ask me these things, unless the world changes much more than I expect it to) ask me what the opening phase of parenthood was like, I will report that it wasn’t much fun at all. I will say that the fear of doing it wrong and the weight of responsibility and the loneliness of doing nights with no backup swamped my incipient love, and maybe whoever asked me will feel slightly better about their own confusion, as I did when my mother told me that she had a struggle persuading me to breastfeed. It’s clear to me now that I was in a state of shock which lasted for months, and still, when I see new mothers who are clearly on some higher plane of mad love, I feel a little twinge of failure. 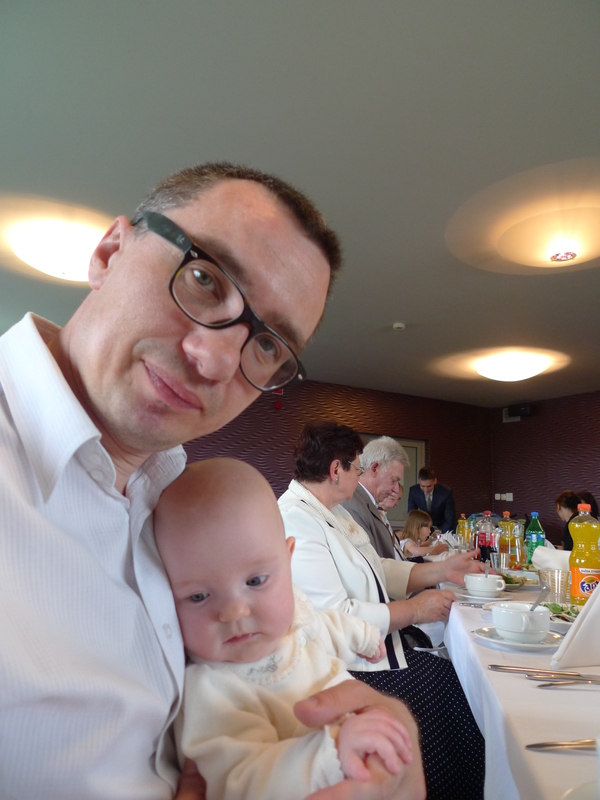 We spent our May holiday in Gryżyna, in the euphemistically named ‘reclaimed territories’ near the German border. Before the war, this was a part of Germany, a resort for Berliners with a lake and a forest full of deer called Griesel. There was a mansion on the small rise occupied by the village shop, with a fountain that serves now as a bonfire pit. At the edge of the village stands an old manor house, fenced off and guarded by a territorial dog. Avenues of oaks lead to the lake and through the forest- barely misted with green when we arrived, they unfurled over the week, and by the time we left the forest had become a greenwood once again. Now Griesel is a Polish village, that collection of open secrets and festering resentments, guarded over by a motley herd of hounds, including the headman’s killer sausage dog. The other rulers of the village are the Hardbread family, who account for the majority of its population. They own the shop and the headman belongs to their ranks. We go to Gryżyna for the forest, the lake and our second family, who have a house there with a poison-green lawn and a stream gurgling by. They interest themselves in the fate and history of the village and have started a website, griesel-gryzyna.eu , dedicated to stories, old photographs, discoveries about the village and the land around it. The story of Gryżyna is one of destruction and transformation- the settlers, many from the east in territory made over to the Russians, moved into the houses vacated by the departing German owners and erased their traces. Murders perpetrated by the Russians against the Germans at the end of the war are disregarded disdainfully by the Poles – the idea of German suffering complicates Polish narratives about the war and their own martyrdom. While we are there, the headman organises Clean-Up-Gryżyna day. Most of the natives (who like to throw their rubbish into the creek) decline to participate, but the summer people and the tourists (us) take our bags and go off to scour the forest for old brooms, bits of tinfoil from now-defunct bongs, countless bottles and old pieces of plastic. Somebody turns up a nineteenth century coin. Our friends, cleaning up their gully the next day, unearth a human skull, deprived of its lower half, green from a long sojourn in the creek. The rest of its owner is nowhere to be found. There is richness and mystery in Gryżyna, for our friends, who have bothered to look, and for us, who vicariously enjoy their discoveries. There are ghosts and old bitternesses and loud silences and small resentments. And because this is Poland, there is the endless echo of the war and of the huge migrations it brought in its wake. In the pictures the prewar inhabitants (now long dead) herd their geese and look out from their untouchable place in time, wiry and unsmiling. I love the idea of history by place, the detail, the old tales that come up, distorted by the prisms of storytelling and time. Here’s to many more journeys and unearthings! Coming back from our May week away, I got a moment (a long one, lasting almost half an hour) of blissful solitude. After starving for weeks on an elimination diet in the hopes it would render Janek’s head less scabby, I took myself to the train restaurant, determined to eat a substantial amount of something at any cost. We were in the Berlin train, and the restaurant car had waiter service and little white goosenecked lamps on the tables so that important international travellers could read and check Facebook over their dinners. Poland flashed passed the window, green and flat. It started to rain and the sight of raindrops hitting the window and the springtime whipping past outside induced a sort of ecstasy in me. I read my book and ordered a pig’s trotter and a beer. When the waitress told me I would have to wait 20 minutes, I smirked to myself. I haven’t been good at acquiring the quick recharge that everybody tells you about, when you spend 5 seconds away from your babies and come back refreshed and ready to do battle for another month. I don’t have that live-in-the-moment Zen where I can roll my instants of freedom about in my mouth and forget that somewhere, not far away, somebody is quite possibly wailing tragically for their own mysterious reasons, and on my return I will have to guess what these are. In other words, I would generally scoff at the idea that half an hour and a golonka could do much for my state of mind, especially when returning with trepidation to the real world after a week of fun and chaos. But it in this particular instance, it did the trick. It was a brief and necessary reminder that my trotter-scoffing, book -reading Real Self still exists, and that I haven’ t turned into a sort of automated emergency response system. There was my little family, happily ensconced in the disabled car, the kids showing their gums to Marcin who had been engaging in Daddy-fun and flying them around like a a pair of giggling aeroplanes. I was unequivocally happy to see them.